UFC's Brock Lesnar returning to the WWE? It ain't happening very soon. Former UFC Heavyweight champion, Brock Lesnar, told ESPN’s SportsCenter last Tuesday that his WWE return is unlikely to happen. He even added that he is perfectly content with his current situation. 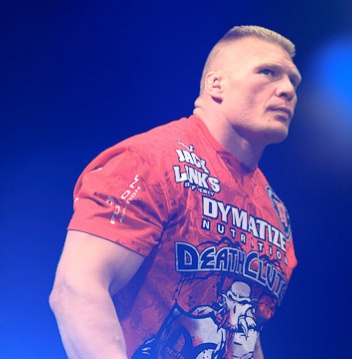 Since joining UFC in early 2008, Brock Lesnar’s name has appeared in many WWE rumors. Many even suggested that the champ put the request into UFC officials himself. However, Brock Lesnar shot the idea down. He pointed out that he’s focused with being a TUF 13 coach, and getting ready for his upcoming title contender bout at UFC 131 against Junior dos Santos. Would you like to see Brock Lesnar back in WWE? Or would you rather let him stay inside the Octagon?